One of the most basic uses of essential oils is diffusion, which is essentially a fancy way to say “getting the oils into the air so you can smell them.” This whole concept is pretty foreign to our Western allopathic medical thinking, which says if it ain't swallowed or injected it probably ain't working—but if you consider it, it makes a lot of sense. For one thing, the human sense of smell is incredibly powerful, and it’s linked very directly to our emotions and memory. (My grandmother used to wear L’air du Temps. I can smell it in my head to this day, as clearly as I can smell my mom’s spaghetti sauce, or my grandpa’s cigar.) Scent-memory has a very immediate and direct impact on our psyche, and that is a link that could be used to our advantage. In times of stress or depression, the very act of smelling something we associate with relaxation or peace directly links our current mental state to the one associated by the fragrance. In a more concrete and scientifically measurable way, dispersing the oils into the air so we can breathe them means we are actually inhaling the chemical constituents of the oil into our bodies and respiratory systems. It’s not something we think about, but when we smell something, we do so because molecules of that which we smell are in the air, entering our bodies. (Think of that the next time your flatulent spouse makes your eyes water.) (Eew, or maybe don’t.) It’s why airborne viruses are called “airborne.” Something gets into the air, we breathe it in, and it’s inside us, absorbed into our lungs and/or nasal membranes. The most basic and least equipment-intensive method of diffusing and inhaling the oils (and probably least effective, honestly), is the “put a couple of drops on a tissue and tuck it into your collar” method. That’s what I used for my PPD, though, since it was immediate and easy, and it took the edge off until other methods had time to work. When my husband and I are sick, we’ll each put a little spray of eucalyptus oil on our pillow, which helps open up our nasal passages and helps—one hopes/believes—kill any other nasties we might otherwise be breathing onto each other in bed. If we really wanted to keep the air clean and bug-free, we’d do better to get an actual nebulizer or diffuser; nebulizers are most effective and also most expensive; fan-based diffusers are also effective in smaller spaces. Heat-based diffusers are okay, but heating the oils changes their chemical compositions and may make them less effective. One can find all kinds of diffusers, all over the place—Nature’s Gift (I swear, I don’t work for them, they’re just my main source for All Things Aromatherapeutic) has a very good and wide selection, with very thorough descriptions of the capabilities of each; so does Mountain Rose Herbs. There are diffusers you can plug into your car a/c jack, there are diffusers you can plug into the wall, there are even diffusers you can stick into your computer’s USB port (with a gig of extra storage to boot!). There are ceramic diffusers that absorb the oils and then disperse them into the air, which cover less space but also do not require power to run. And I have been known to put a few drops of the oil on a tissue and lightly tape it over one of our furnace vents—that’s fairly effective as well, if a little cheesy looking! Diffused essential oils are being used for all kinds of things—to keep air in public environments less prone to harboring viruses, to help induce mental states of either greater alertness or greater calm, to address depression, and even in some children’s classrooms (including and especially kids with special needs) to help promote focus and diminish scattered behavior. Obviously researching the effectiveness of these methods is a challenge, especially with no giant pharmaceutical companies lining up to fund such studies, but anecdotally they seem to be meeting with some success. · Thyme—nasty-smelling, one of the best anti-viral and anti-bacterial oils around. · Basil—I also can’t stand the smell of this, but along with Thyme it’s highly effective. I don’t know why Thyme and Basil are so lovely smelling in red sauce but so icky when diffused in a room…but heck, they work. · Manuka—a little more off the beaten track, it’s related to the melaleuca (tea tree) plant and, some say, has even more germ-beating power. · Tea Tree—of course. Tea Tree oil is good for pretty much everything. · Pine and Cedarwood—also very good air-cleaners, antibacterial and antiviral. If it were me, and I didn’t have much in the way of oils yet, I’d probably get some mixture of Lavender, Tea Tree, and Eucalyptus as my flu-season hard-hitters. I’d throw in a little peppermint or lemon if the winter blues were getting my family down, or maybe a little chamomile if my kids were getting unbelievably squirrelly and cabinfeverish, and diffuse it in the family room all evening after school. Again, if anyone tries any of these, I’d love to hear how it works for you and what you think! Is being green a religion? Or part of it? : Going Green Mama asks if "being green is a kind of religion in itself, part of living out your faith, or do you do it for other reasons?" Superhero Secrets for a New Year: Green Bean shares some link love and ponders if living sustainable is unsustainable. Teens for Jeans: EnviRambo spreads the word about a jeans recycling drive. Bawk!! 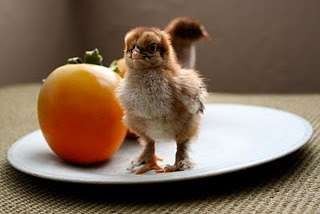 Adventures in Chicken Farming: Green Bean lists tips about what she learned after a few months of raising backyard chickens. Book Review: Cheap: The Conscious Shopper reads Cheap by Ellen Ruppel Shell, and loves it. The Great Shampoo Bar Experiment: The Greenhabilitator experiments with shampoo bars. Cookbook Roundup: Jenn the Greenmom shares her favorite cookbooks and asks what your favorites are. A Dose of Hope: EcoWonder finds hope in dark times. Crayon You Be My Valentine? 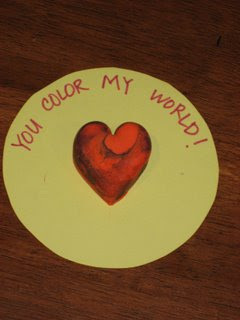 : Green Bean makes Valentines with her kiddos out of melted crayons. Black Bean Burgers: A recipe for black bean burgers from JessTrev. Herman's Hermits: Some days, EnviRambo wishes she could be a hermit. 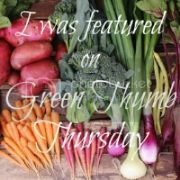 The Road to Victory: Green Bean shares how she transitioned from a traditional grassy lawn to a front yard victory garden. New Design for Green Phone Booth: A friend of JessTrev's gives the Booth a facelift. Getting Religion: Ironically, almost exactly a year before Going Green Mama's post on environmentalism/religion (see first bullet point above), The Raven pondered the same question. After several months of mooching off my friends for free babysitting, I decided one day, "Screw this. I'm taking my kids with me." But that wasn't the only thought that led up to my decision. I thought about how I often left my kids to go to meetings and how they had no clue what that meant or where I went. I wanted them to recognize that the community gardens issue was something I felt passionate about, and I wanted them to know how to get involved (something I certainly wasn't taught and have had to muddle through figuring out). They'd had kids there before. That meeting unfortunately was not a success for many reasons, but here's something else I didn't mention on the last post: I've taken my youngest with me to meetings several more times. He's three now, and without the distraction of his older brothers, he's fine. It would certainly be more convenient for me and less distracting for other people if I left him at home, but I'm making do with the situation I'm in right now. Underbelly pointed out in the comments of the last post, "Bringing children into public spaces has been a long-standing feminist issue, because more often than not, when you discourage children from being in public spaces, you discourage women, too." I think she makes a great point, but from my experience, it's not so much that children are outright discouraged as it's just out of the norm to see them there. But it won't become the norm until more of us are brave enough to do it. Some meetings are appropriate for kids, and some aren't. All of the meetings that I've taken my kids to have been pretty casual. If I think someone important is going to be there, something really important is going to be discussed, or the meeting will be a little more formal in some way, I find a babysitter. Some kids will do better than others. I am lucky to have three kids who can sit still and entertain themselves for at least an hour with about an 80% success rate. Not all kids are like that, and only you know how your kid would do. Kids do better one on one. It's just the nature of siblings that they can't let an hour of life go by without a squabble. That's how memories are made, right? Taking all three of my boys to that first meeting was my number one mistake, and one I will not make again. Be considerate. Have you ever been to a movie where someone has brought their newborn baby and he cries through the whole thing? Remember how mad you were because you couldn't hear the movie over the darn baby? Don't be that person! If you're kids are disrupting the meeting, leave until they've calmed down. Be prepared. I bring a snack, art supplies, a portable DVD player with headphones, and my iPhone. Every time I take my little one with me to a meeting, my stomach squirms in anticipation of what might happen. Will someone ask me to leave? Will he disrupt the meeting too much? I'm sure there have been people at those meetings who've grumbled to themselves, "Why is a kid here? So unprofessional. What an annoyance." But no one has ever said those words out loud to me. Instead, I hope that most people leave those meetings thinking, "Having a kid there wasn't too bad" or "I barely noticed him." Maybe one or two think, "Maybe I could do that sometime." I hope that my bravery makes it easier for someone else to be brave next time. 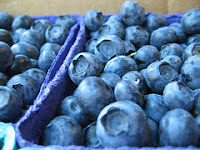 If you eat Kellogg's, Target brand foods, Betty Crocker, or General Mills there likely are fake blueberries in your food. NaturalNews.tv recently posted a video showing products that market themselves as a blueberry product but have few or no blueberries and instead have dyes, sugars, and fats. This is not the first time a food company has been caught trying to trick us, it happens everyday. This isn't even a first for Kellogg's who is currently in trouble over claims that their Rice Krispies cereal helps kids immune system. False claims are everywhere but it's easy to spot them. All you have to do is read the labels. One big hint that the company is trying to trick you is dyes. Dyes are used to make food look better and often to trick us. And while this form of marketing is poor and can be harmful to consumers, there is more to this story. Those fake blueberries are full of nasty things. 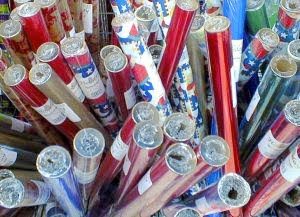 The dyes are made from things like petrochemicals and are linked to hyperactivity, allergies and even cancer. The fats are often partially hydrogenated oils also known as trans fats. Trans fats are linked to heart problems, liver problems and again even cancer. And we all know to much of any kind of sugar isn't good for us but the sugars in these products are often things like high fructose corn syrup which has been linked to liver disease, increased weight gain, and seems like something new everyday. High fructose corn syrup even has been found to often contain mercury. So there are many reasons to stay away from these products, so remember to read your labels! Was this a shock to you? Did you have any of these products in your house? I miss my herbs. I miss my garden. But it’s in the winter months that I take greatest advantage of that other plant-derived medicinal wonder, the distilled essential oil. So I’d like to take a few weeks to talk about my experiences with essential oils, kind of share what I know, and invite you to do the same in the comments. Essential oils (or EOs) can be used in a variety of ways, but let me start by mentioning how they should not be used: do not take them internally, and do not use them undiluted on your skin. These are extremely extremely potent concentrations of the alkaloids in plants—it takes 5000 pounds of rose petals to make 1 pound of rose essence. By extension, where any given plant might be very “safe” in its normal plant form, its essential oil might be deadly in fairly small doses. Keep these away from kids, treat them as you would any potentially lethal medications you have in your house. And do your homework. · Lavender—this is an amazing all purpose oil. Relaxing, antibacterial, and just plain nice-smelling. It is also said to harmonize with whatever purpose the oils its blended with are there to accomplish, and strengthen their effectiveness. · Lemon—great antiseptic and cleaning oil. I use it to clean the kitchen and bathroom (a few drops in my vinegar/water cleaning solution), as well as adding it to my favorite antidepressant blend. I also use it for my homemade hand sanitizer, although the citrus oils can be sensitizing and aren’t always a great idea to use on the skin. · Peppermint—good for headaches and nausea; a good cooling oil, for helping with fevers and flashes and such. For headaches, mix a couple of drops with a neutral carrier oil like olive or grapeseed, and rub it on your temples. · Eucalyptus—good for coughs and congestion; we often give our pillows a spritz at bedtime when we’re stuffy-nosed. · Tea Tree—I’ve blogged before about this super-oil; it’s a champ antifungal and antibacterial oil, one of the few oils that’s mostly considered safe to use undiluted on the skin (though not all aromatherapists agree--generally diluting it in a carrier oil is considered safest). I use it in diffuser blends, deodorants, salves—this is a must-have. · Clary Sage—this maybe isn’t one to put in the “basics” list, but it’s also one of the oils I’ve used most, and one of the few I’ve actually emptied a bottle of and needed to buy more. Clary is a “woman’s” oil, effective (usually in a blend) against PMS, cramps, and a lot of hormone-y ickiness. Combined with lavender and lemon, clary is the main ingredient in my anti-post-partum-depression blend. Any other essential oil lovers out there? What are your favorite oils, the ones you come back to again and again? 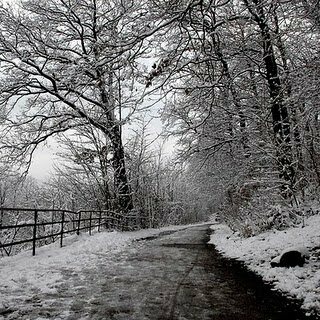 Beating the Winter Blahs: The Conscious Shopper lists some tips for getting over the winter blues. Re-calibrating your internal thermostat: EnviRambo describes how her family has gotten used to keeping their thermostat set to a low temperature in the winter. Why I Started Eating Meat Again After Ten Years as a Vegetarian: One of the most controversial posts here at the Booth, The Conscious Shopper details her decision to become a flexitarian. Blah Blah Bottled Water: The Conscious Shopper provides some reasons to break your bottled water habit. One Thing Leads to Another: The Greenhabilitator wonders if her small personal actions really make a difference in the big scheme of things. A Confession: Jess of Sweet Eventide "sins" at Target. Finishing What I Started: EcoBurban dons her cape to become EcoWonder. Through green colored glasses: EnviRambo welcomes her husband to the "dark side" - the dark green side, that is. Use It Up, Wear It Out, Make Do, Close the Loop: Green Bean replaces her worn out doormat with one made of recycled flip flops. News Flash: JessTrev points out some news articles that caught her eye. My family likes yogurt, but for a while now I've been annoyed by the little plastic cups that I can't recycle in my weekly pickup. And how many little cups can you really save? I started buying the larger quart sized containers to reduce waste, but lately I've gone back to the smaller containers because it's easy to send them to daycare with my son Joshua. I've transitioned to making a lot of our foods at home, but up until a couple of weeks ago I never thought I could make my own yogurt. I wasn't willing to buy a special piece of equipment, and I didn't want to have to buy enzymes or cultures and keep them in the freezer. It just seemed like too much of a pain. However, that's not true! I stumbled upon a method to make homemade yogurt using things I already had: a thermos, a thermometer, milk and a spoonful of yogurt. I figured I could at least try it. 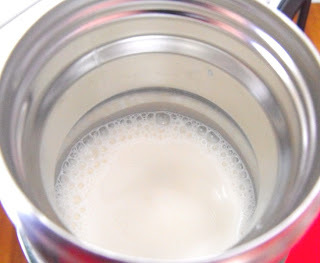 I was completely shocked at how surprisingly easy it is to make homemade yogurt! I'm sharing some step-by-step instructions so that you, too, can make your own yogurt! Step 1: Measure milk into your thermos. Since thermoses are different size, I won't give you an exact measurement because it will vary. I stole one of my husband's thermoses so it's pretty large. Step 2: Bring the milk to a boil. You can do this in a pot on the stove top or in the microwave in a microwave-safe bowl. I've done both ways, and this time I used a pyrex bowl in the microwave. It took about 5 minutes, stopping to check it every minute or so, to come to a boil. Tip: watch the milk carefully. I hate the smell of burnt milk! Step 3: Allow the milk to cool to 122 degrees F. This is the temperature at which the yogurt cultures will be most happy. Variation: If you prefer to have raw-milk yogurt, skip the boil and just heat the milk to 114 degrees F. This lower temperature will preserve the enzymes that are destroyed in the pasteurization process. I choose to use pasteurized milk, but that's a post for another day. 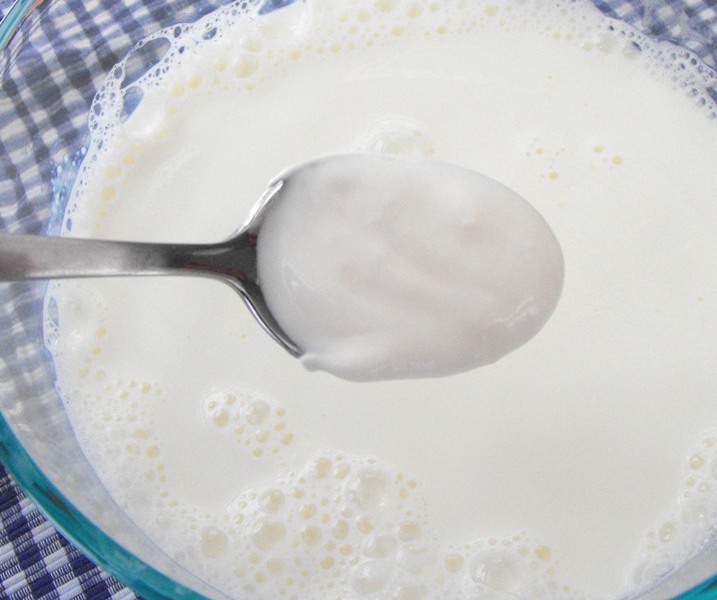 Once the milk has cooled, stir in a spoonful of yogurt. You can use store-bought or homemade yogurt leftover from your last batch. This contains the cultures that will transform your milk into yogurt. Step 4: Pour your milk back into the thermos and screw on the cap. 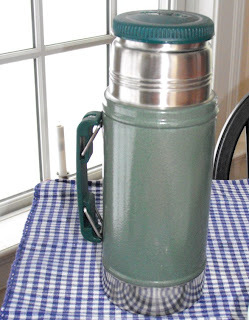 Find a place to let the thermos sit for 8 to 14 hours so the cultures can do their work. 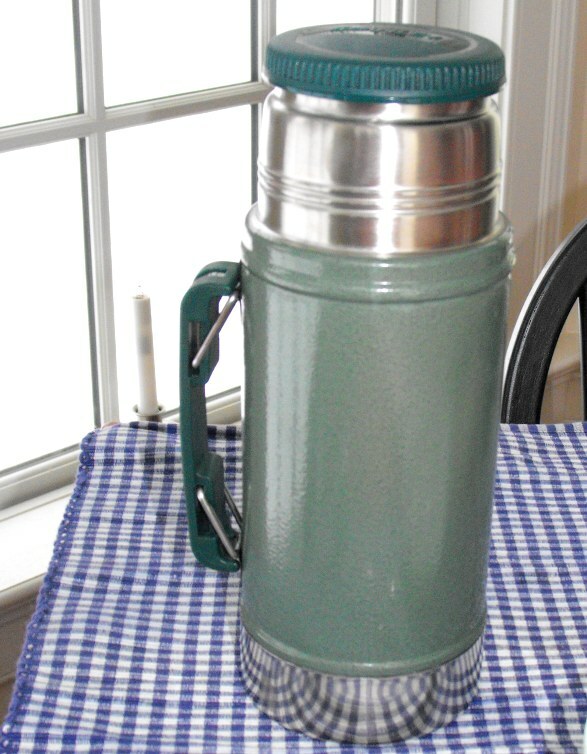 Step 5: After 8-14 hours, open up your thermos and this is what it will look like. Don't let it fool you, that's yogurt! You can stop here if you like your yogurt to have a thinner consistency. Just transfer it to a different container, stir the whey back into the yogurt, and store it in the fridge. Step 6: If you want a thicker consistency like Greek Yogurt, allow the yogurt to drain through cheesecloth. I let my yogurt to sit for a hour or two for a thickness similar to sour cream. If you want it even thicker, allow it to drain longer and you'll have yogurt cheese, which is a nice substitute for cream cheese. Step 7: Transfer the yogurt to a container and store it in the fridge. You probably want to chill it before you eat it. And don't forget to save the whey! You can use the clear liquid as a substitute for milk or water in bread or pancake recipes. Serve your yogurt plain or with fruit, honey, maple syrup, granola and/or preserves. You can also use it as a substitute for sour cream in dips and dressings. One of my favorite ways to eat yogurt is to make a layered parfait with strawberries. I've heard that you can use any type of milk (whole, 2%, 1% or skim) to make yogurt, but I've only tried it with whole milk. Finally, I titled this post "Waste-Free Yogurt" because I've just recently found a local(ish) source of milk in glass bottles that are returned and reused. So we're not only saying good-bye to plastic cups, we're saying good-bye to cartons and jugs, too! 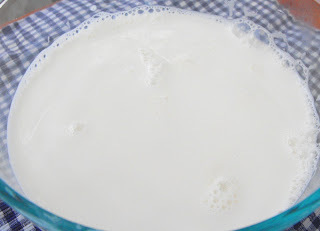 If you've never made your own yogurt, I hope that I've demystified the process! A confession from Green Bean. It was a windy Sunday. Sitting next to me, my mother suddenly pointed out the window. Behind her, my oldest squinted and read in the slow deliberate speech of an emergent reader "E-State Sale." I spun the wheel left and we barreled up the hill. We pulled into a tight set of townhouses. Up the stairs with several reminders of "look with your eyes" to my two boys, we opened the door, passed the tables of jewelry and racks of clothes. Those really aren't my thing. Peeking into the kitchen, the counters were denuded. There was no garden here and, as it was near the end of the sale, well, most of the good stuff would be gone. When closing down a sale, everything is 50-75% off but there's usually only furniture and virtuous waste left. What is virtuous waste, you ask? As someone who aspires to be green, there are certain things that are clear no-no's. Wrapping paper and ribbon. Notecards. Ziplock bags. Those stick on bows for presents. Single use anything, really. And, while, the title of this post might be a bit overstating the matter, I do think there is such a thing as having your single use product and using it too. I love the slow life of handmade, homemade, soaked over night, and so on but there is also something about an occasional bit of convenience - so long as I don't have all the guilt that goes into acquiring it in the first place. These are just a few of the things I indulge in at yard sales, in dim thrift store aisles, and on the hot keys of Freecycle. Maybe buying these wasteful items isn't virtuous, but I keep them from going straight to the landfill. I do recycle or reuse as much of them as possible. And, yes, I do get just a bit of a thrill from being wasteful virtuously. Are there any eco-no-no's that you still enjoy? How do you work around the guilt? Helping Out by Doing Without: Going Green Mama suggests taking on a fiscal or environmental challenge and then donating your savings to a good cause. Superhero Secrets ~ Green is the New Pink: Valentine's Day ideas from the Greenhabilitator. TakeOutWithOut: Says Envirambo, "The TakeOutWithOut (TOWO) campaign aims to reduce restaurant waste by raising awareness to the outrageous amount of unnecessary waste we create every day." Designing a better world: Regular GPB guest poster Karen Moser-Booth dreams about a car-less nature-filled future for Americans. Life Without Plastic Bags: The Conscious Shopper says bye-bye to plastic grocery bags. A whole new food challenge: The Greenhabilitator experiments with a gluten-free and casein-free diet. When things (or lack thereof) aren't the answer: How do you parent? : Going Green Mama asks for parenting advice - what do you take away to discipline your kids when they don't have many toys to take away? Waste not, waist full: Green Bean shares some of the ways she avoids food waste. A good mind is a terrible thing to waste: Envirambo takes us inside her head as she takes a trip to the grocery store. Ringing in the Era of Responsibility: Green Bean accepts her civic responsibility by volunteering at her kids' school. The Love of Justice: The Raven reflects on justice and mercy. Oh the weather outside is frightful, and the kids are so delightful...Actually, they're ready to come out of their skin with excitement... Because it's winter, and SNOW is outside! Sadly, as both parents are down with a bug, outdoor play is unlikely. So this month's edition of reclaimed crafts focuses on winter projects the kids can do, hopefully without that trip to the store. After we get through the hustle of the Christmas holidays, it seems like we're all in the mood for a big cleanse. Rip down the decorations. Purge our extra belongings. So "winter decorations" don't just appear too often, either in home decor or in children's activities beyond making cut-out snowflakes. Yawn. The Magic Onions has directions for making bird feeders, something that can easily be done with cookie cutters and leftover ribbon from the holidays. Or you can take a simpler path and just do as we did: take pine cones, "paint" them with peanut butter, and roll them in a mix of leftover sunflower seeds, raisins and nuts. The birds of course, ate them up in no time! My kindergartener has been learning about "King Martin," as she called him, this week in school. In honor of Martin Luther King Jr.'s birthday, we checked out part of his "I have a dream speech" (which really helps bring that historical figure to life). We've also been checking out education.com, my new favorite go-to place for activities for the kids (it covers a broad range of topics from preschool through high school). If my ears and sanity will cooperate this weekend, we might even try making this African Djembe drum I found at education.com. (OK, we would have to make two for parity.) Looking at the instructions, you could likely scrounge up materials and eliminate the twine (used mostly for decorations and to cover glue lines) and stick to the small terra cotta pot, plastic lid and container, and beans. 3) mom or dad are not sick. I think we'll have to settle for an indoor version like the one at Roots of Simplicity, which offers directions for makeshift indoor snowmen stuffed with plastic bags or sheets. What are your favorite ways to creatively entertain your children indoors? As he passed through the kitchen moments ago, Mr. Truffula remarked on his trip to the grocery store earlier today. "You know," he said, "I bought only a bag of bananas and a few bottles of juice." Little did he know that this was exactly the topic I wanted to share with you today. Ha! Validation! I'm not the only one whose radar is picking up that our "normal" has shifted. A few months ago, our grocery store list would have covered the entire back of an envelope. Why an envelope (rescued from the paper recycling)? Because, of course, it holds the stack coupons to be used on the shopping trip. The thing is that today's trip required no envelope, and involved no coupons. In fact, those packets of coupons in the Sunday paper -- the ones which are supposed to save you so much money that they more than pay for the cost of the newspaper -- have become largely irrelevant to us. The coupons don't apply to things like sacks of over-ripe or singleton bananas, or five-pound bags of carrots. The potential savings on shampoo, conditioner, and hair dyes are nil when you're a committed no-poo'er and trying to embrace the grey. And what's a dollar off of the latest antiseptic, ultra, super-duper dirt zapper when generic baking soda and vinegar are the order of the day? Factor in a Diva and cloth liners, and a whole other coupon category goes pouf! Our dishwasher has taken on a chronic state: full. What's filling it up? Glass jars. Lots of jars. That's right, my jar situation has taken on new dimensions. The refrigerator and freezer are loaded with large jars of broth and soups. My little lunch bag is populated with smaller jars for transport. It's a constant dance of filling, emptying, washing, and repeating the process. What's given me even more pause is... our waste stream. We dutifully use our recycling bin, but it doesn't see as much love from us as it once did. Great Scott! I think the trash can use has been steady, or a hair below. Like the dishwasher, the bucket next to the sink for to-be-composted items is full all the time. By weight, I think our amount of waste has actually gone up. Oh, my stars! Granted, the relatively heavy compostables get turned back into luscious black gold for the garden, but still... What the cuckoo is going on?! I think the causes are two-fold: 1) we've been buying increasing amounts of locally-produced food, often direct from the farmer; followed by 2) a significant change in diet. We've got our milk farmer; our egg farmer; our cheese producer; our dear CSA (which I've quit this year, but that's a (happy) story for another day, and we're still going to volunteer lots of time in their fields); and our nut, seed, and dried fruits source. Plus, if all goes well, I hope to have a good amount of veggies flowing from our own garden this coming growing season. The (coconut oil) frosting on the (nut flour) cake is that we've turned the family diet on its head. We were already moving in a real foods direction. Now, two of us are GAPSing. The 25-words-or-less description is that we went grain-, starch-, and sugar-free, with generous portions of fermented goodies for good measure. Most prepared foods are out the window (along with those coupons for them). We're cooking loads from scratch, which is what's spiking our food scrap generation. 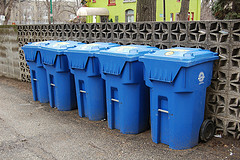 With less foods coming out of cans and other containers, we have fewer cans, bottles and jars for the blue bin. When we're the ones jarring up those precious bone broths, soups, and leftovers, we slap on a reusable Tattler lid, and ultimately add to that dishwasher situation I mentioned. Whether your new year began at the Solstice, on January 1, or is taking a fresh start with the Lunar New Year next month, what differences have you noticed in your own households between 2010 and 2011? What did you expect to notice? What was unexpected? What observations are you happy to trumpet, and which ones (like noting that your recycling has gone down) are less suited for sharing with polite company? In any case, a Happy New Year to you all! Milk. It may do a body good, but it drives a green mom crazy. At least the non-vegan green moms. I started buying organic milk long before my pregnancy. Thanks to media attention, I was aware of the dangers of hormones in milk long before I considered the health or eco-implications of every single decision I make in the grocery store. So, organic milk. That was easy. Then my son was born and I went off the green end. First, I worried about the plastic. Milk is not sold in glass bottles at any of my local grocery stores. I kept buying plastic jugs of milk and recycling the jugs all the while worrying about leaching. So, I started having local milk (pasteurized, non-homogenized) delivered every other week and buying organic milk (pasteurized and homogenized) at the store the alternating weeks. That was easy. Now, I’ve read about raw milk before. And with all the food recall scares, I opt to err on the side of paranoia and buy pasteurized milk. But I had not thought about what "homogenized" means in terms of health. Anyway, homogenized… According to my friend, the farmer explained that his milk was not homogenized and would separate. He did not want her to think that the milk was bad if she noticed separation. But he went on to say that non-homogenized milk is healthier. He said that our bodies digest the different size particles differently. He indicated that the smaller fat particles of homogenized milk are more likely to contribute to the clogging of our arteries and heart disease. Obviously this farmer is biased toward his product, but my friend is a nurse practitioner and she said that it is an interesting theory. Apparently, a Dr. Kurt Oster theorized that the homogenization of milk was causing an epidemic of heart disease. (The timing of the epidemic coincided with the widespread distribution of homogenized milk.) This theory was studied from the early 1960s until the mid-1980s and has been disproven. So I’ve now spent hours trying to find a non-biased, fairly easy-to-understand answer to my original homogenization question only to be told that even the scientists do not know what other questions I need to be worried about! I should’ve listened to Ruchi and The Conscious Shopper! After reading about this subject, I'm inclined to look for the least processed milk that I can legally buy. I think that would be non-homogenized milk that is pasteurized using the vat process at 145 degrees. Anyone know something else I should know before I declare this my final answer? Please note that the website hosting Enig’s article is by a company that advocates raw milk. I tried to find unbiased sources, but they were more technical and much longer. I think Enig’s article sums up what I found elsewhere, and I like her credentials. • The Weston A. Price Foundation maintains http://www.realmilk.com - includes sources for raw milk by state, should you be interested. • Law firm Marler Clark maintains http://www.foodsafetynews.com. “Raw Milk: An Issue of Safety or Freedom?” is an interesting read. Do you have any good sources of information about milk and the effects of processing or packaging? What is your take on raw milk, different levels of pasteurization, and homogenization?